Developed by AASL in collaboration with ALA’s Libraries Transform and sponsored by Bound to Stay Bound Books, download the Because Everyone Is a Learner infographic at standards.aasl.org to help you spark conversations with stakeholders in your learning communities. 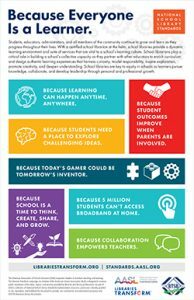 AASL and ALA’s Libraries Transform are collaborating on a campaign that will extend beyond this infographic. School library-focused Because statements, supporting data, and downloadable graphics will be available at librariestransform.org. In addition, AASL sponsor Bound to Stay Bound Books is funding print distribution at AASL Affiliate state conferences, a spring mailing campaign to more than 90,000 superintendents and elementary principals nationwide, and print advertising in two administrator trade magazines with a combined total circulation of 223,000 readers. To build the future we imagine, our children will need to be deep thinkers, questioners, inventors, researchers, readers, inquirers, innovators, and creators. As we consider this and its significance at this point in our profession while reflecting on the Common Beliefs from the new National School Library Standards, school librarians are positioned at the very center of teaching and learning. Consider how our roles in co-teaching, knowledge creation, curation, reading, intellectual freedom, inquiry, collaboration, and information access dovetail with the world we imagine for our students. We know these roles well. Do your administrators know them and support them? 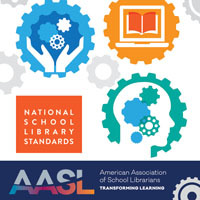 Take a deep look at the recently released Common Beliefs delineated on the AASL Standards web portal at standards.aasl.org. Determine how these beliefs align with your vision of your library practice and your administrators’ vision of the learning community. The articulation of these Common Beliefs aligns with our own vision as school librarians and reminds us why we do what we do. They provide the guiding principles for a school library that fosters the world we envision as well as the vision of school administrators across the country. As you think about preparing yourself, your program, and your administrator for the new standards before they launch, what are your action steps? In preparing yourself for the new standards, consider how these Common Beliefs align with the goals of your school and district. Listen carefully to your principal and ask the right questions. Sometimes listening is enough, but often following the listening with, “How can I help with…?” or “What can I do to support…?” makes all the difference and opens the door to conversation. Determine what keeps your principal up at night. Knowing what is happening in your school is critical. Whether it’s student achievement, graduation rates, attendance, school safety; whatever it is, you have access to resources that can help. Find articles, videos, or research studies that relate to the concern and share them. Select the most relevant. Don’t overwhelm your principal; he/she is busy. Curate the resources so that they are easy to access. 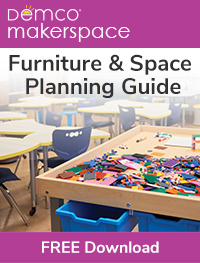 For most school librarians, finding the perfect set of resources is a strength! “Have you considered…” is a phrase that can be used with your principal to emphasize the new Common Beliefs. For example, if one of your school’s site-goals is centered on making learners college and career ready, you could have a conversation with your principal that revolves around the AASL Common Belief: Learners should be prepared for college, career, and life. You can describe ways that the library helps support this by starting with the phrase, “Have you considered how the library can support students as they become college and career ready?” and then proceed to present a variety of examples. If one of your site-goals is about school climate, you could focus on this AASL Common Belief: The school library is a unique and essential part of a learning community, and elaborate on the myriad of ways your library supports diversity, inclusion, and learner engagement by being a warm and safe learning environment and gathering place for all. If your site goals include a literacy goal, you could have a conversation that shares all the Common Beliefs but hones-in on: Reading is the core of personal and academic competency. You get the picture, find the commonalities to the broader school mission and share how your library fits in and which of your practices elevate these goals. Be explicit about this alignment. Share a copy of the new Common Beliefs with your principal. Take a look at the Shared Foundations at the standards portal: standards.aasl.org (See links in upper right corner). You can find an infographic for each of the six Shared Foundations: Inquire, Include, Collaborate, Curate, Explore, and Engage. Click on each icon to expand the explanation more deeply. As you study these infographics, you will find starting points for their implementation. Again, determine how to relate these foundations to your school’s mission and goals. One way is to read what your administrator reads. For example, the October 2017 issue of Educational Leadership, a periodical read by many school administrators, focuses on problem-solving. 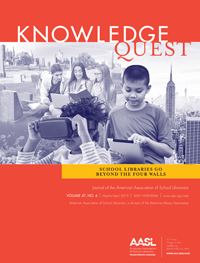 There are many articles appropriate for school librarians who champion the Shared Foundations of Inquire, Engage, Explore, and Collaborate. You could easily email the names of a few of these articles to your principal. Briefly and explicitly make the connection between the content and the specific Shared Foundations in your correspondence. After the new AASL Standards are released in November and you have spent time reading and reflecting on them, tweaking the “elevator speech” above could be one way to approach your principal, your superintendent, and/or your curriculum director, depending on your school district’s structure and who needs to know about the new standards to make a difference for your learners. You may have to repeat your speech and meet with several administrators before everyone who supports your work is on board for some vital changes to the library’s support of students’ future. Every meeting about the new standards with an administrator catapults your school library to the center of teaching and learning!